Pascha von der Weyermühle gained his BH while his litter-brother, Pacco von der Weyermühle, passed the Finnish ZTP with 1A rating for character and SG for conformation in 1996 and tested clear for PHTVL / PHPV. 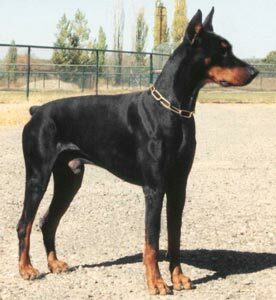 Their brother from an earlier litter, Ningicosan von der Weyermühle, placed 30th at the IDC Weltmeisterschaft in 1999 and passed the Körung with Körklasse 2A rating. Pascha's sire, Hertog Conan van Manensheide, was the winner of the D.V. Meisterschaft in 1993 plus winner of numerous show titles and passed the Körung 'for life' with highest rating for hardness and working drives while his dam, Gina von der Weyermühle, passed the ZTP with 1A rating for character and SG for conformation.